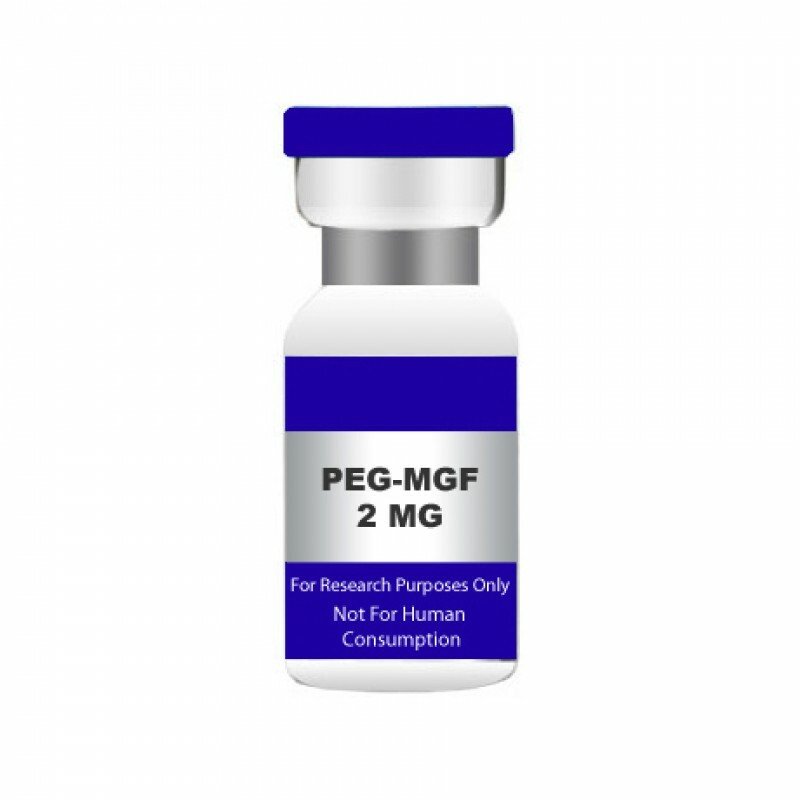 PEG-MGF 2MG Pegylated Mechano Growth Factor is a Research Peptide Hormone Mechano Growth Factor adds pegylation process to amino acid peptides synthesis is an original interlaced variant of IGF-1 (Insulin Like Growth Factor-I). MGF is a splice variant of the IGF gene which increases stem cell count in the muscle and allows for muscle fibers to fuse and mature. This is a process required for growth of adult muscle. Natural MGF is made locally and does not travel into the bloodstream. Synthetic MGF is water based and when administered intramuscularly, travels into the bloodstream. MGF is only stable in the blood stream for only a few minutes. PEGylation is the act of attaching a Polyethylene glycol (PEG) structure to another larger molecule (in this case, MGF). The PEG acts as a protective coating and the theory here is that this will allow the MGF to be carried through the blood stream without being broken down Product: PEG-MGF Unit Size: 2 mg/vial CAS NO. 616204-22-9 Molecular Formula: C121H200N42O39 Molecular Weight: 2948.15 Appearance: White Powder Synonyms: peg MGF,Mechano growth factor,IGF-1 EC BUY PEG-MGF, PEG-MGF 2MG WARNING This product is a very potent peptide. This product is NOT for human use and can be harmful if ingested. This product is for research/laboratory use only. This product is NOT in a sterile solution and is NOT to be injected. This product should only be handled by licensed, qualified professionals. This product is not a drug, food, or cosmetic and should not be misbranded, misused or mislabeled as a drug, food or cosmetic. The latter article is intended for educational / informational purposes only. THIS PRODUCT IS INTENDED AS A RESEARCH PEPTIDE ONLY. This designation allows the use of research peptides strictly for in vitro testing and laboratory experimentation only. Bodily introduction of any kind into humans or animals is strictly forbidden by law.